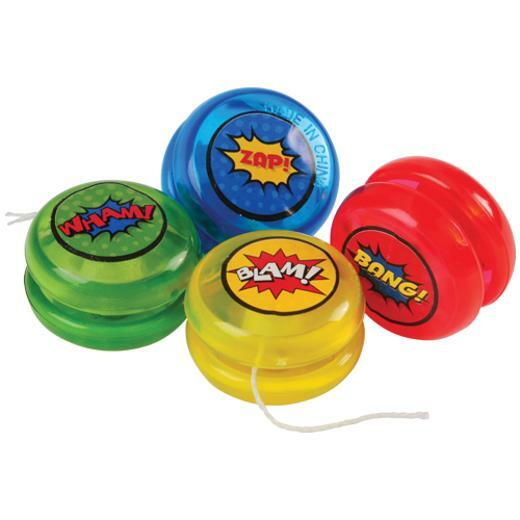 Cheap Superhero Mini Yo-Yos - 12 Ct.
Superhero Mini Yo-Yos - 12 Ct. Perfect addition to any superhero themed event! Forget "walk the dog" when you can "fly the superhero"! These superhero-themed mini yo-yos features pop art words pulled from the pages of your child's favorite comic book and make an ideal party favor for any themed event! All they require is a simple flick of the wrist to make them roll down and back up. With some practice, your little guests will be inventing their own yo-yo tricks in no time! L: 6.0 in. W: 0.95 in. H: 6.65 in.